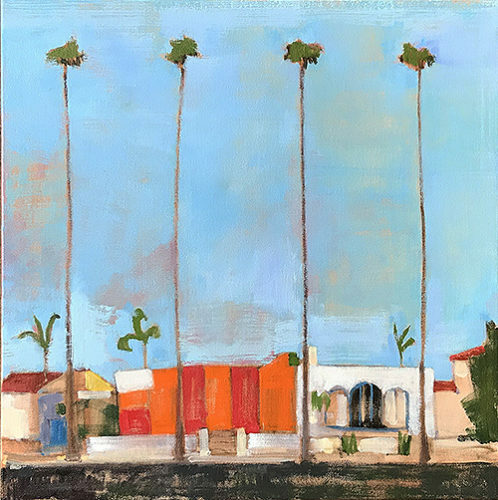 Two palms in front of a Streamline Moderne garage on Coronado. 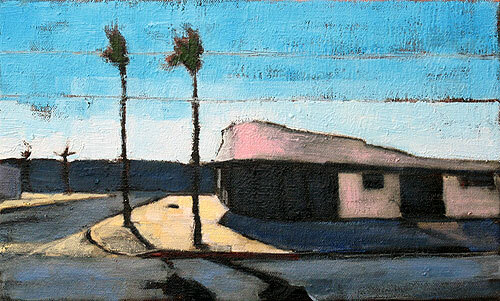 This entry was posted in Landscape Paintings, San Diego Paintings and tagged 8 x 13 inches, california, landscape, oil, oil on canvas, palm trees, san diego, streetscape, urban on December 30, 2012 by Kevin. I’m normally pretty uncomfortable about donating paintings to raise money in the wake of major disasters. I hate when people turn those disasters into publicity stunts. But last night I read a lot of personal stories on Facebook of people trying to deal with the storm and its aftermath. I won’t go into the gory details. I remember after the nuke disaster in Japan, animal charities were pretty strapped. I would like to help if I can, and I’ll donate the proceeds from this auction to an animal charity in the disaster area, so if you like the painting, please feel free to bid in this charity auction. Bidding starts at $100, and the auction fees are waived. The proceeds from this auction will go to Empty Cages Collective, a New York-based animal and environmental advocacy organization. 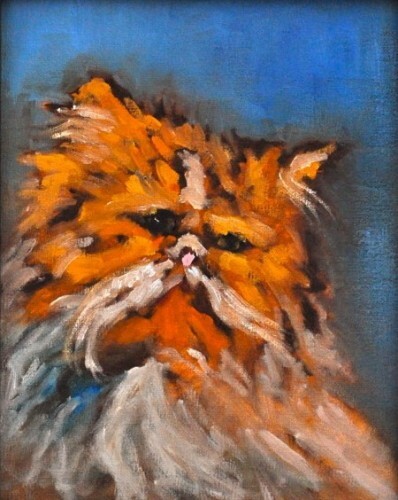 This entry was posted in Cat Paintings and tagged 8 x 10 inches, animal, auction, cat, charity, ginger, hurricane, oil on canvas, orange, persian, pet, sandy on October 31, 2012 by Kevin. 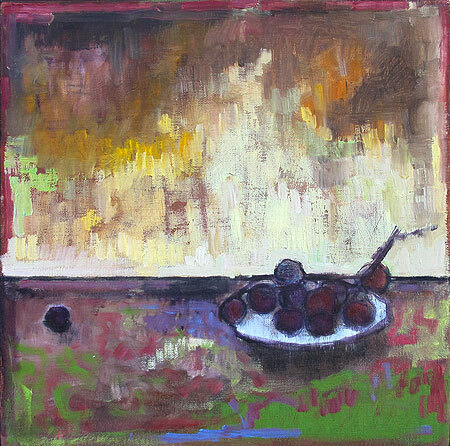 Landscape painting of summer morning light in Balboa Park, San Diego, California. I love to walk the trails here. 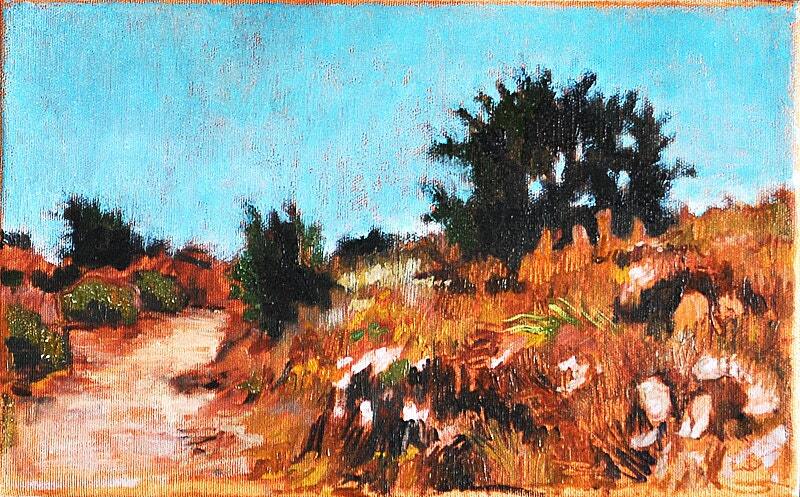 This entry was posted in Landscape Paintings and tagged 8x13, art, california, landscape, oil on canvas, san diego on July 8, 2012 by Kevin.